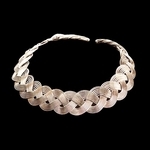 This cotehardie in silver seems to be the stuff of myths and legends and not a period replica, but looks may deceive. Our silver princess cotehardie is based on the picture of a woman's robe from the 13th century! The lightweight, semi-transparent dress falls elegantly to the floor and trails out into a short, romantic train. The sleeves and scoop neckline are edged in silver braid, and a narrow silver cord ties at the waist to result in an ultra-feminine look. This is a special order item, it will ship in 1-2 weeks.